Merrill Garbus and long time musical collaborator/bassist Nate Brenner return, officially as a duo now, with Tune-Yards’ latest release I can feel you creep into my private life. With the ongoing advent of technology, their ability to layer sounds and complex rhythms gets incrementally more adept over time. Even though there may be some old school sounds on display, there is not an intent to fully mimic an earlier musical era a’la LCD Soundsystem. 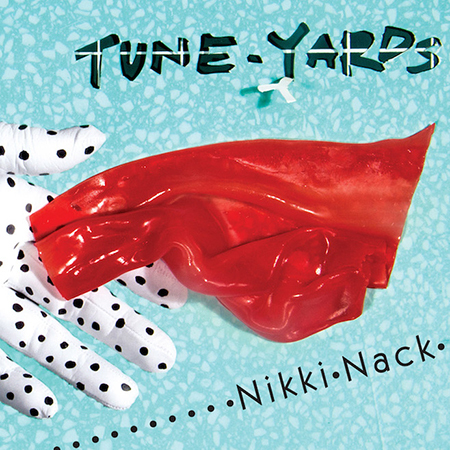 The ever advancing Tune-Yards on their fourth album (Tune-Yards 4.0 if you will) press forward with musical technology and also more clearly bring social issues to the forefront. Garbus isn’t here to provide solutions but more to call out society’s demons, if not her own. If the first step to defeating a problem is to identify it, Garbus lays them out for us and pleads on our behalf. From racial differences and privilege, homelessness, lack of trust, climate change, and a general inability to move forward (“we jump so high but fall right back” she sings on the opener ‘Heart Attack’), she spells out the problems. Most importantly though, Garbus does something here on most tracks that has been generally lacking in their prior albums, she sings from her gut as if her life and ours too depended on it. Unquestionably Garbus has one of the most powerful and malleable voices in the rock context today, but the sheer power she puts forth in genuine cries for help ups the game on I can feel you considerably. Without specific reference to the current political landscape in the U.S., the topics are nonetheless all still very timely. Though the fear of invasion of privacy (which takes title billing) seems almost quaint in the face of a full out affront on more basic precepts of a civilized society. Knowingly, Garbus singles out the great swindle and lack of trust amongst us all as a recurring theme. Whether the lack of trust is in our leaders or with each other, Garbus paints herself complicit along with the rest of us. The first single ‘Look at Your Hands’, with a driving retro synth beat and Garbus’ wails over myriad injustices, hits hard as she flip flops between telling us to look at “your hands” or “my hands”. Lines like “robbing my own brother” and “selling me water off my own land” highlight the shoddy state of affairs. The hands metaphor of “look what I did” recalls Lady Macbeth and her inability to wash off murderous spots. Even the album’s cover implies “look at my hands don’t look me in the face” as palms and splayed fingers cover up Garbus’ identity. The theme of lack of trust recurs on the best linked couplet of songs here: ‘Now as Then’ and ‘Honesty’. The former song starts with an effective internal dialogue with Garbus’ simply spoken voice being as compelling as any of her other vocal modes, but breaks into layered cries of “don’t trust me that I won’t take all the money and run” that exemplify the firepower on display throughout the album. The following ‘Honesty’ begins with the single word title chopped and layered over and over before finally inserting the word gone right after. Garbus’ question of “Do you really want to know?”, turns into a cry of “No, No, No” with this song turning into an almost gospel like shouter towards its close. Brenner’s bass here is at its lowest thrum plumbing the depths of the river of mistrust cited in the song. Sonically speaking the duo doesn’t leave their rhythmic roots too far behind as several songs use the schoolyard patois and handclaps of prior hits like ‘Water Fountain’ including ‘Look at Your Hands’, but also the jump rope chorus of “He won’t get off my back” of ‘Hammer’ and the more meandering ‘Private Life’. Brenner’s bass work is evident throughout the album but the man vs. machine dynamic is particularly prominent on the ecological battle of ‘ABC 123’ as he counterpunches back and between anything Garbus throws his way. Ultimately though as with any Tune-Yards album the key comes down to the quality of Garbus’ vocals, both tone and lyrical content, and she runs circles around herself here making I can feel their consistently strongest release to date. The side by side tales of New York sinking into the sea on ‘Coast to Coast’ and California going up in smoke on ‘ABC 123’ are both compelling with the right/left march of the former and invite to “meet in the middle” painting a picture of self-inflicted coastal annihilation. The bookended tracks of ‘Heart Attack’ and ‘Free’ display Garbus’ best vocal pyrotehnics with her anguished cries of “Don’t let me lose my soul” and “Don’t tell me I’m free” coming as purely recorded as opposed to any mechanical trickery being used. This repeated dosing throughout the album of Garbus throwing her hands up in despair as she desperately calls out for understanding and solutions for us all are what ultimately gives this great album its pulsing human heart in the midst of skittering rhythms. And when Garbus throws up her hands we have no choice but to see her face, hear her voice and we're all the better for it.